Today, November 30, 2013 on Shabbat which is a day of rest and no work, time to be spent in the synagogue starting in the morning, turns out to be the Arabs' Day of Rage. They are demonstrating right in Haifa with over 1,000 who turned into a riot. Police were called in with riot squad who were pelted with stones. This was against the Prawer Plan or Law which affects from 40,000 to 70,000 Palestinian-Bedouin who live in the Negev. The Negev comprises 60% of the land allocated to be Israel. Demonstrations and debates have been going on about it since about October 10th in the Knesset. Thousands more demonstrators have planned to demonstrate on this day in Gaza, Ramallah, Berlin, The Hague, Cairo and 25 other cities in the world. The Prawer Law/Prawer Plan/Prawer-Begin Plan is the step decided on in September 2011 taken to bring about the Bedouins into Israeli society and reduce the economic and social gaps between their population in the Negev and the Israeli society. It will then allow Jewish families to settle in the Negev to make the desert bloom. Small gated farming communities have already developed close to the Bedouin villages that have water and electricity. The Prawer plan is designed to be part of a campaign to develop the Negev. Existing bedouin communities will be expanded. Some unrecognized communities will be recognized and will receive public services. Infrastructure will be renewed within the framework of the Beer Sheva District master plan. Most residents are to be absorbed into the Abu Basma Regional Council and the nature of future communities will be decided in full cooperation with the local Bedouins as to whether they will be agricultural, rural, suburban or urban. This might mean moving about 30,000 Bedouin in the Negev to more permanent existing Bedouin communities close by. This might mean ending their traditional cultural and social life in the name of development which goes on in all American cities. For example, right here in Portland, Oregon, South Portland was a neighborhood of Italians and Jews. In the name of Urban Renewal, the city had the right to completely destroy this area which meant homes, school and synagogues (Neveh Zedek Synagogue, which was the synagogue I attended) to put in revamping of the whole area. It happened in the 60's. The Negev was land given to Israel in the very beginning of the divide between Israel and Palestine, which Palestinians refused. This is a big piece of the 20% left to become Israel and Israel has allowed the Bedouins much time to themselves. The largest minorities in Israel are the Arabs and the Druzes. In 1972 the minorities numbered 458,500. Almost half lived in about 100 villages and 2/5ths lived in towns which included 73,000 in Jerusalem. 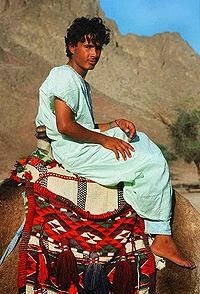 The rest which numbered about 44,000 were semi-nomadic Bedouin. Some 75% were Muslims, 17% Christians and 8% Druzes and others. Israel's law ensures equality before the law for all, without distinction of race, religion or language and gives its Arab citizens every opportunity to maintain their own culture and traditions. There is, however, no peace between Israel and her Arab neighbors except for Egypt and Jordan. Israeli Arabs are sometimes torn between their loyalty to Israel and their Arab kinship. Coexistence between Jews and Arabs of Israel have had 65 years to get used to it and there has been a growing pattern of coexistence. At least 27 Arab villages are represented in mixed Arab-Jewish local or regional councils. Apart from the Bedouin, 82.5% of the Arabs live in areas with local government. This 5 year plan is to improve the Bedouin living conditions. Israel claims they are nomads and they claim that they have settled in villages more than 100 years ago and have led a sedentary, agricultural based life for more than 20 years now. "The rate of growth of the Negev Bedouin is the highest in the world – the Bedouin population doubles its size every 15 years." The Negev makes up more than half of Israel (60%) and has been a stark dry land that is a desert without the endless dunes of white sand like the deserts of Hollywood movies. This is just plain dry wilderness going from mountainous heights to flat land far below sea level made up of dirt, rocks and canyons. Once, it was land covered by the sea. You can find fossils of ancient sea animals if you take a jeep tour of the desert. For most of the year this is hot and dry land, but in early spring it has a beautiful carpet of green grasses and colorful wildflowers. The Bedouins are an Arab people who travel the desert looking for fresh water and pasture land for their donkeys, goats and camels. Their camps have an occasional TV antenna among them. Israel has brought in modern irrigation which makes it possible to support new communities like development towns, cities and industrial centers. Far to the south lies an experimental farm on Kibbutz Ketura that was founded in 1973 by Americans from the Young Judea movement. Israeli agriculturists have had success in growing persimmons, pomegranates, kiwi fruit, litchis, kumquats, and have already sold them in European markets. They have domesticated the "sabra" which is a prickly pear into one with no thorns now. A field of sunflowers carpets the land in the Upper Negev at the right time of year. Ketura has a garden of experimental fruits brought in from the wilds and marketplaces of Latin America, India and Africa. They had worked on the black spote, a purple fruit with an inside like chocolate pudding. This has become an ice cream flavor in the Negev town of Beersheba, which is probably the largest town in the Negev. They also have developed the ber apple which is a dark brown plum tasting like a combination date and apple and many others. The Negev can be viewed from the air where you can start at the southern tip of Israel and see Eilat. Not far from Eilat which is a port, is the city of Timna where the mines of King Solomon's engineers built the country's fortune by mining rich deposits of copper. Jordan and Egypt are its boundaries. Beersheba is a modern city with 130,000 and goes back into our ancient history. Kibbutz Sde Boker is where Ben Gurion lived out his life after being President of Israel in a hut. The Ben-Gurion University is here. In the center of the Negev Desert is a valley with steep walls that looks just like a crater., Makhlesh Ramon. 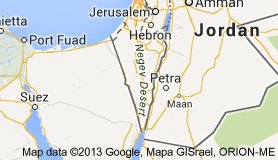 This Negev extends over 5,138 sq miles or 60% of Israel. Rainfall is less than 200 mm. It's home to Israel's Badlands like in the USA where cowboys and Indians fought it out which is in the southernmost section which is made up of eroded rocks. After the Exodus with Moses leading out the Israelites from Egypt, the Beersheba-Egypt route was developed. The southern Negev was occupied by nomadic tribes, the Amalekites. The northern part belonged to the tribe of of Simeon, which later amalgamated with Judah. David won over the Amalekites and Edom which opened up Elath and the copper mines to the Israelites under King Solomon. At the same time, the Israelites had maritime trade going on with the Phoenician from Elath to Ophir which is in southern Arabia. Back in the 1860's Mark Twain, author of Tom Sawyer and Huckleberry Finn, took a trip to the holy land. He described the Bedouins that he saw as "tall, muscular, very dark-skinned Bedouins, with inky black beards. They had firm lips, unquailing eyes, and a kingly stateliness of bearing. They wore the parti-colored half bonnet, half hood, with fringed ends falling upon their shoulders, and the full, flowing robe barred with broad black stripes-the dress one sees in all pictures of the swarthy sons of the desert. These chaps would sell their younger brothers if they had a chance, I think. They have the manners, the customs, the dress, the occupation and the loose principles of the ancient stock. They attacked our camp last night, and I bear them no good will. Twain continued to say that he saw evidence of cultivation-a rare sight in this country-an acre or two of rich soil studded with last season's dead corn-stalks of the thickness of your thumb and very wide apart. But in such a land it was a thrilling spectacle. Close to it was a stream, and on its bands a great heard of curious-looking Syrian goats and sheep were gratefully eating gravel. I do not state this as a petrified fact-I only suppose they were eating gravel, because there did not appear to be anything else for them to eat. " In other words, 146 years ago they were lousy farmers and lousy shepherds and would attack strangers. They were pretty wild people from this description of one American writer who was not happy with them on his 1867 voyage to see the Holy Land. Today, "The population of the Israeli Negev is around 640,000 and of that total there are around 210,000 bedouin. Few of the Israeli bedouin lead the nomadic lives that mist the eyes of European arabists and retired British foreign service personnel and expats. Indeed, a few thousand live in illegally built houses, many of them in shacks without basic services. Many settlements lack essential infrastructure, including sewage systems and electricity, and access to services such as educational and health facilities is limited. Around 14,500 bedouin have settled illegally within the danger zone of the Ramat Hovav Toxic Waste Disposal Facility in the Negev. All residents will be given property rights. Already, a further 120,000 bedouin live in planned and regulated settlements in 7 urban centres in the Negev and in two regional councils with 11 villages. Those moved will be relocated close by where they had been living. What Israel is doing is trying to build a better country for all Israeli citizens including the bedouin minority. The Innocents Abroad by Mark Twain page 203.